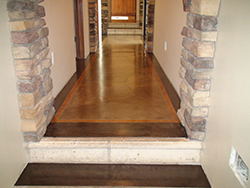 Concrete Stain | ACI Flooring Inc.
Reactive acid stains use hydrochloric acid and metallic salts in a water solution that are applied to the top of concrete substrates which react with free lime and Portland cement in the concrete. It lightly etches, penetrates and drives the stain into the surface. These stains are typically natural colors in earth tones and are very attractive. 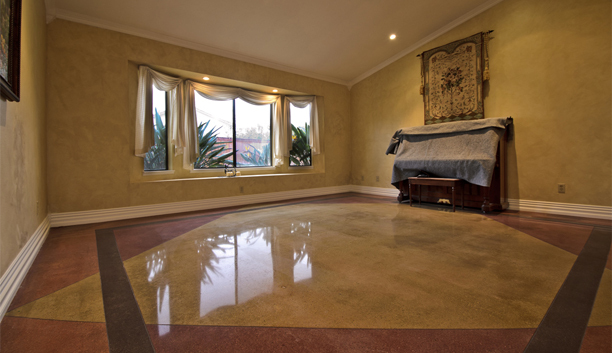 Concrete accepts reactive stains very well because it is very porous. Blended colors can create different effects i.e. leather, marble and natural stones. Reactive stains are suitable for any walkway, driveway, patio or sidewalk. 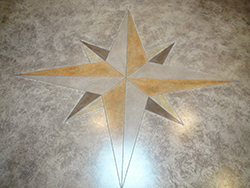 These stains have been used for many years in lobbies, hotels, casinos, driveways, walls, patios, decks and walkways.